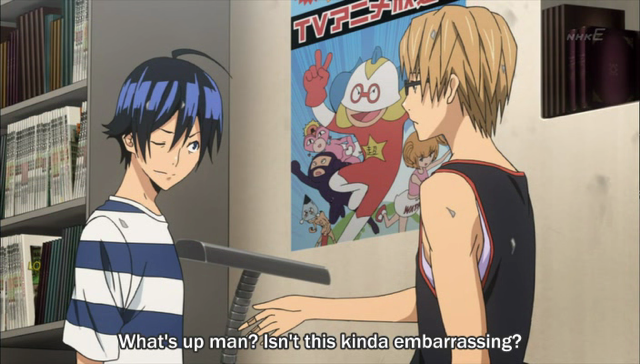 In episode 5 of Bakuman, our budding mangaka dedicate their Summer vacation to creating their first manuscript. After several weeks of hard work, little sleep, and fast food they are ready to call the editorial office to show someone the results. One task accomplished, and a goal in sight. I was quite impressed that this episode managed to cover the entire creation of their first manuscript (Earth Two). This gives me hope that the energy level will remain at least this high, which is something I wasn’t quite sure of as the episode began. 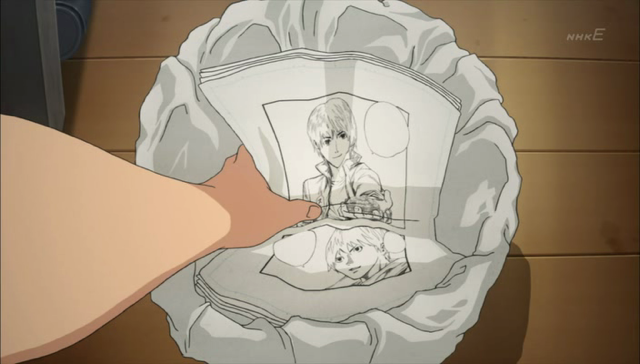 I was curious how Shuujin’s storyboard would come out. (Apparently translators are reconsidering use of “name” for this artifact — I’ve adopted storyboard accordingly). As can be seen above, his earliest efforts are very simple, and barely qualify as illustrations. The panels are mostly symbolic, and there is little variety in panel design or layout. 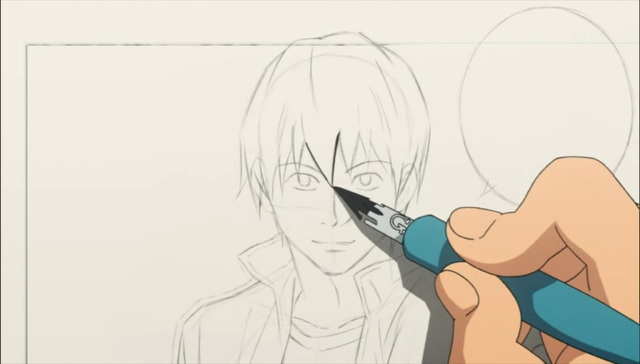 Shuujin keeps working on the storyboard. 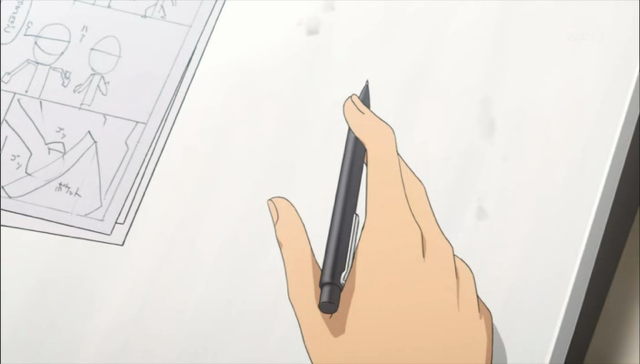 Here we can see that Shuujin uses a mechanical pencil. 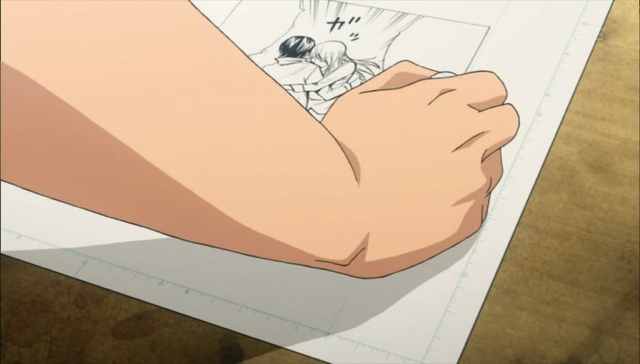 The storyboard is still simplistic in execution, but there is more detail, and panels are designed to represent different shots, a mid shot, depicting two people from the waist up, and a detail close-up, sometimes called a “cut-in”, depicting a hand in a pocket or bag. 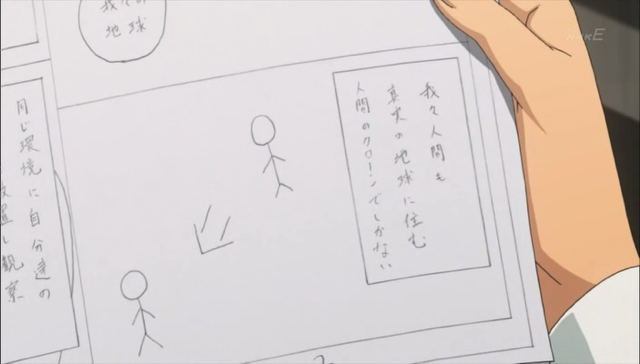 The storyboard as revised by Saiko. 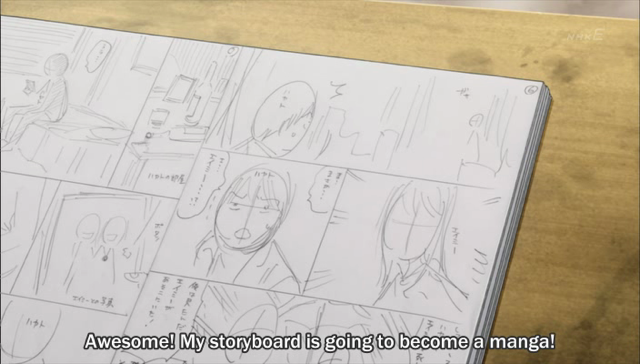 Saiko improves Shuujin’s storyboard by adding environmental details, giving a sense of emotional reaction to the sketch figures, and even enlivens the layout by varying the panel placement (such as using a page-wide panel on the top-right). Time to put that G-pen to good use. The page designs represented by the storyboards are first transferred to manuscript paper, where the illustrations are considerably refined. After the design is finalized, Saiko inks over the lines. Needless to say, this is a grueling process, and it is easy to make mistakes, especially when you aren’t sleeping as much as you should. The courage to demand the best from one's-self. In addition to outright mistakes, Saiko chooses to throw out entire pages that don’t stand up to his high ideals. There is a saying in the Computer Science community, “build one to throw away.” The idea is that you should fully expect to throw away a significant portion of your early design and/or source code, because you will learn things in the process that will force you to re-evaluate design decisions. 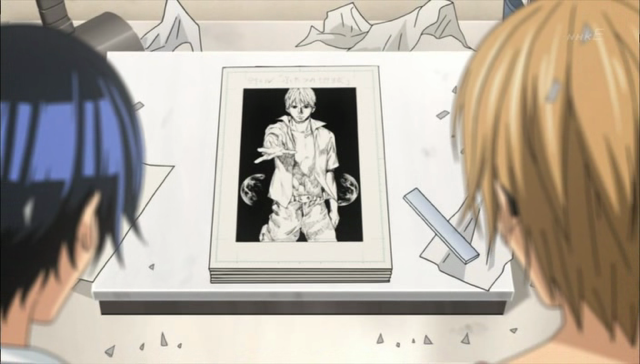 In his case, Saiko also re-evaluates his work after looking at the work of a rival, and finding his own work lacking in comparison. White out cleans up mistakes, like stray lines and spots. After inking, Saiko uses liquid paper to clean his work. Dialogue will have to be added later. Right now the manuscript is only two tones: black or white. Cutting out patches of screen-tone (and making a mess). All that is left is to add the tones. 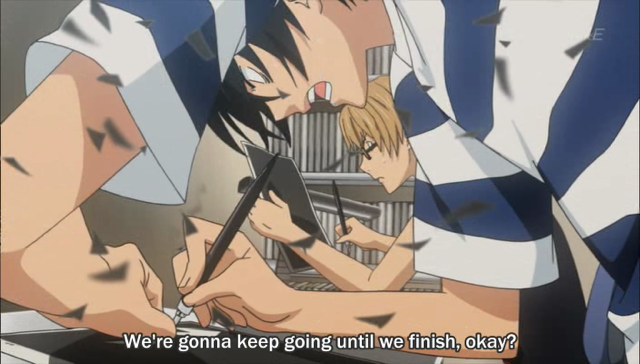 Here Shuujin offers to help, and is assigned all of the pants worn by the Earth Army. This sounds like a realistic approach, as he isn’t given a lot of creative decisions, and the risk of him making mistakes is restricted to specific parts of the manuscript that have minimal impact. 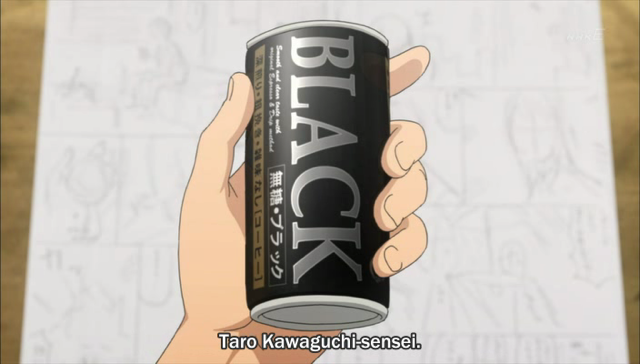 The boys have finished their first manuscript, and the episode ends with Shuujin placing a call to the editorial office of Jack. I honestly did not expect to see the manuscript completed this soon, so I am quite excited to see what happens next.